2012. HarperCollins. Hardcover. 321 pages. In a nutshell: The Round House is about Joe, a 13-year-old boy living on a North Dakota reservation in 1988. At the start of the novel, Joe’s mother is raped and nearly killed by a perpetrator she either won’t or can’t identify. Throughout the summer, Joe grapples with the emotional aftershock of his irrevocably changed family, and also seeks to find the person who attacked his mother. Although the premise of The Round House is grim, I wouldn’t say that this is a dark-toned novel overall. 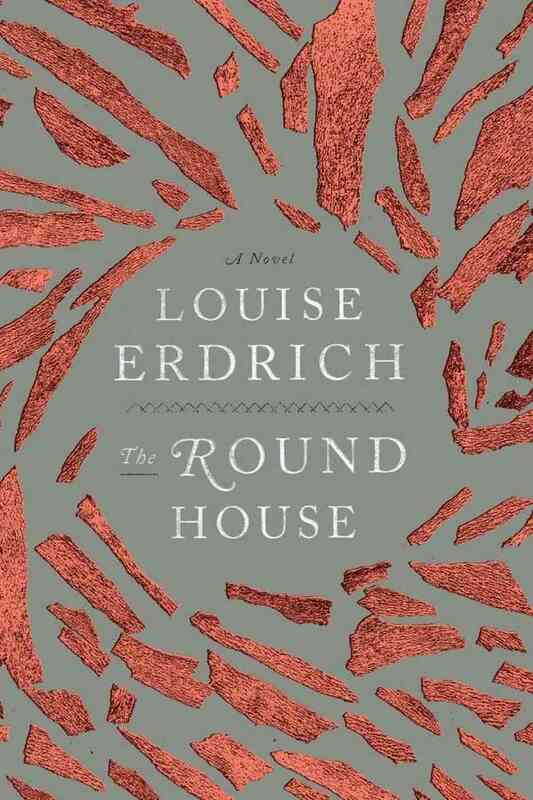 Erdrich lets a lot of light and kindness and even humor thread through the story, mainly in her depiction of the various characters that populate the reservation’s community. One of my favorite side characters was Linda, a white woman who was raised on the reservation by an Ojibwe hospital staff member after her parents rejected her at birth for a congenital deformity. I liked how Erdrich stopped Joe’s narrative a third of the way through for “Linda’s story” which is engrossing in its own right while also shedding light into Joe’s story. Erdrich also interrupts the narrative later for a folktale/history told by an elderly relative of Joe’s named Mooshum. I use the word “interrupts” but I don’t mean it negatively. Instead Linda and Mooshum’s stories show the importance of telling and listening to each others’ stories. As Teresa of Shelf Love said in her recent review of The Round House the book conveys the idea that “Our stories are our own yet part of others’ stories.” Joe’s mother, Geraldine, also gets a chance to tell her story, after a period of lengthy silence. Back to the light and kindness and humor, much of the story involves Joe’s friendships with three other boys, who nerd out over Star Trek and get themselves into mild trouble by drinking beer and crashing church youth group events. This kids-of-the-summer vibe brought to mind the appealing kids of the movie Super 8. (In discussion of this book, Teresa compared it to Stand By Me, which is a much more classic reference, but alas not a movie I’ve seen.) The Round House includes the kind of tales that adults relish telling about their own childhood, as in, remember the time Cappy ill-advisedly felt compelled to confess a particular sin to the priest and the priest chased him around the reservation. This kind of ready-made tall tale is juxtaposed with characters’ uncomfortable decisions to keep secrets from each other. The Round House also reminded me of Ivan Doig’s The Whistling Season. Both are coming-of-age tales told by an older version of the protagonist who drops minor hints about the future. Namely, these crucial events in their youth help decide their future career trajectories. Doig’s book is set about a century before Erdrich’s, but in the fellow prairie state of Montana. Doig and Erdrich both richly depict the dynamics of family and community. What I also appreciated about Erdrich was her very slight supernatural touches, like a matter-of-fact acceptance of seeing ghosts on occasion. I also liked how the elderly relative of Mooshum has no known age and appears timeless, a tantalizing human bridge to an earlier era that was almost outside of history. That aspect reminded me of some of Lee Smith’s books about Appalachia, like Fair and Tender Ladies or On Agate Hill. I will be sure to read more Erdrich in the future. This was the first book I’ve read by her, despite always meaning to read works like Love Medicine and the Master Butchers Singing Club. I discovered my co-worker Kim is a huge Erdrich fan and she highly recommended The Last Miracle at Little No Horse. 1998. Busted Flush. Paperback. 169 pages. 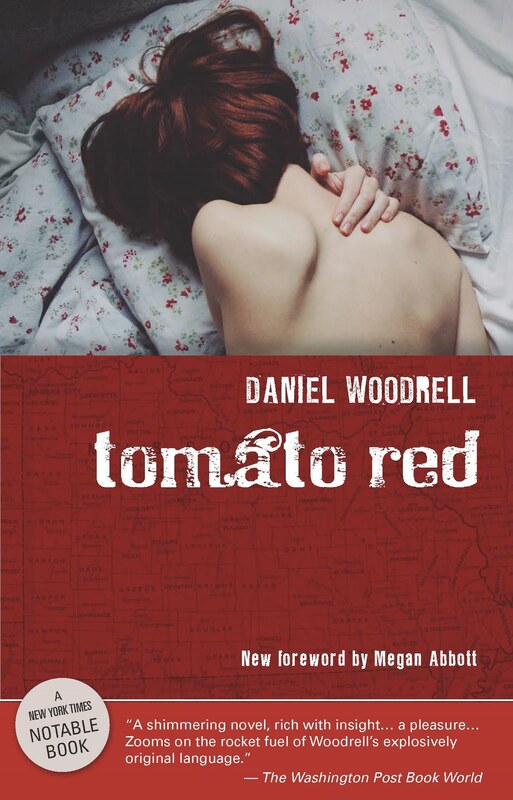 I’m a huge fan of Daniel Woodrell’s Winter’s Bone and have delved into his backlist before by reading his earliest works: the three books that comprise the Bayou Trilogy. Like most of the characters from those books, the central four characters of Tomato Red dwell in the fringes of society. Tomato Red is told in first-person by an ex-con drifter and self-described “loser” named Sammy Barlach. The first-person narration is used to great effect, especially in the beginning and end of the novel. Sammy’s first words to the reader – “You’re no angel, you know how this stuff comes to happen” – starts us off on the tale of how Sammy fell into the company of the Merridew family. With hair the color of the book’s title, Jamalee Merridew is nineteen and wants out of her poverty-stricken life in Venus Holler. Her seventeen-year-old brother, Jason, possesses stunning good looks, and is also, perilously, gay. Their mom, Bev, earns her living as a prostitute; she is practical about her lot in life and disapproving of her daughter’s dreams. Woodrell’s depiction of Bev and Jamalee are very well-drawn, but it is the character of Sammy that has left an indelible impression on me. Sammy’s mind is marked by poverty, lack of education and damaging familial neglect. He informs the reader early on, “I can’t sleep anywhere until I know I’ll get to eat again if I need to”. He is so desperate to belong, that he is instantly loyal to the Merridews, because they are “the bunch that would have me.” I found this heartbreaking. His desperation also manifests itself in a disconcerting tendency toward violence to those who cross him or the Merridews. Sometimes Woodrell’s turn of phrase became too elaborate for my tastes, but sometimes the ambitious metaphors paid off. It’s not a comfortable book by any means, but the storytelling is magic. I am still haunted by Tomato Red. 2010. University Press of New England. Hardcover. 190 pages. With photographs by David Graham. 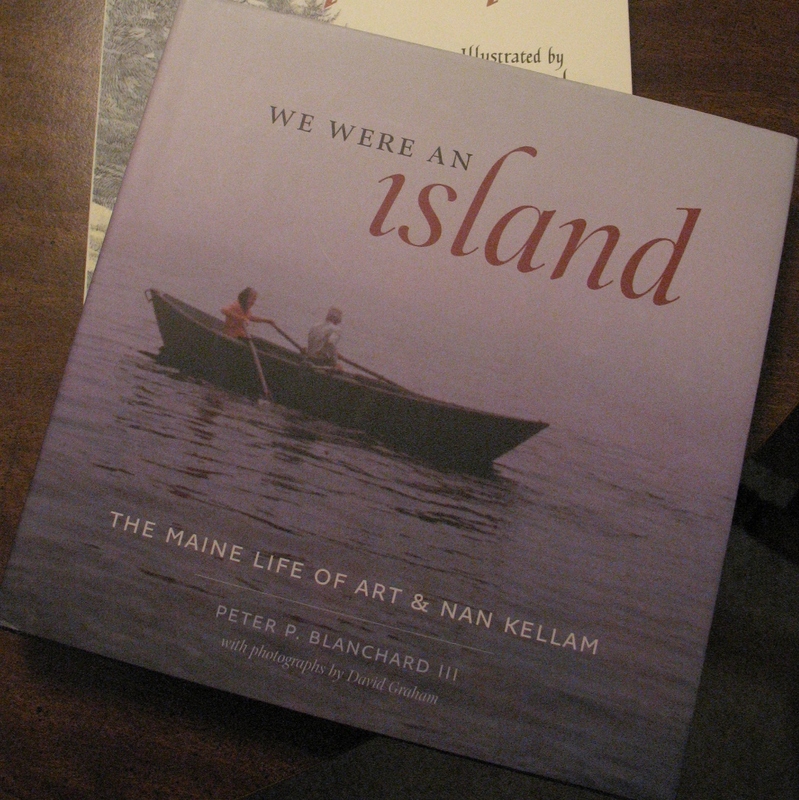 From 1949 to the 1980s, married couple Art and Nan Kellam lived on a small island off the coast of Maine called Placentia. Though they occasionally entertained visitors and friends, or traveled by dory to nearby Mount Desert Island for supplies, they spent most of their lives with only each other for company – and a couple of cats. Peter Blanchard III became friends with Nan Kellam a few years after Art’s death. The couple had decided to donate the island to the Maine Chapter of The Nature Conservancy (TNC) after their deaths, and Peter Blanchard III met Nan in his role as a volunteer for the Maine Chapter of TNC. In We Were an Island, he tells the story of this couple and the unusual life they chose. He extensively incorporates Nan’s diary and the couple’s other writings. 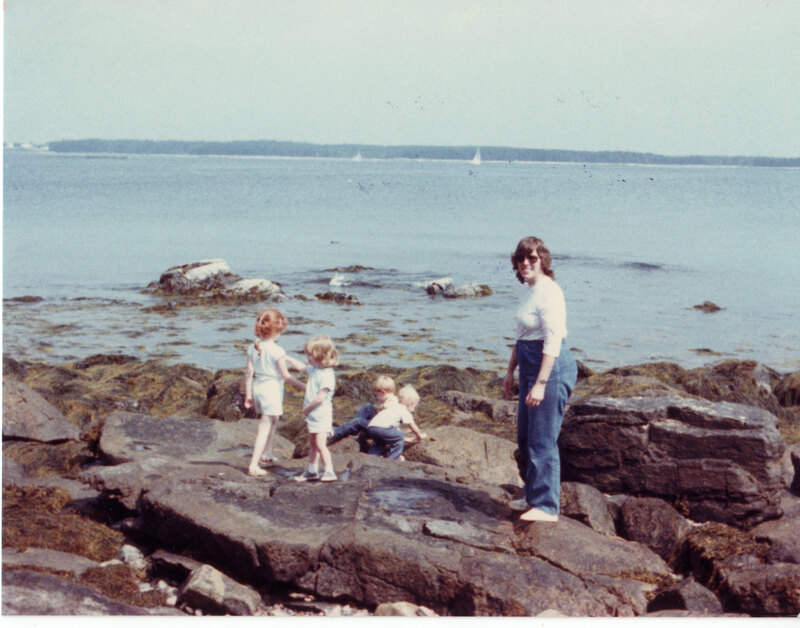 When I was very young, my family lived in Bass Harbor, Maine, which is on the “quiet side” of Mount Desert Island. We could walk down the road from our house to Bass Harbor Light. Elementary school field trips included excursions into Acadia National Park. I imprinted on the landscape, like birds do after hatching. After we moved away to central Maine, trips back to the coast served to encourage fantasies of lighthousekeeping or of living on one of the smaller islands, reachable only by boat. I heard of this book years ago after a blogger had picked it up at a BEA conference. Once I realized the book was about “my” corner of the world, I knew I had to read it. Here was a couple that didn’t just idly imagine living on an island; they planned for it and accomplished it. We even overlapped our residencies in that same corner of the world. Though my parents don’t recall hearing of the reclusive couple, the Kellams shopped at Reed’s General Store in Bass Harbor just as our family did. I must have seen their island – Placentia – in the distance while playing among the rocks and tidepools below Bass Harbor Light. Aside from the personal connections, the book is an intriguing, respectful portrait of Art and Nan Kellam. Blanchard wisely chooses not to order the book chronologically. Though the first couple chapters are about the beginning of the Kellams’ life on Placentia, subsequent chapters are thematically driven: one chapter covers Placentia’s history and the Kellams’ discovery of it; another chapter describes their relationship with local Mainers. I cannot imagine wanting to live in only one person’s company for most of your life. At times, I found the insularity of the Kellams’ life to be off-putting. I mean, as an introvert, it sounds splendid to go to an island for a while, as a retreat of some kind, but I also find a lot of value to life in a community. My favorite parts of the book involved the Kellams’ interactions with other people: how fishermen would offer to tow the couple’s dory on bad weather crossings; their signal arrangement with the residents of the nearby Gotts islands; their friendships with both year-rounders and summer people alike. We Were An Island includes beautiful photos of Placentia as well as archival photos of the Kellams and their home. I found some of the chapters a little slower-going than others, but I enjoyed the book overall. I would recommend it to anyone who loves the coast and islands of Maine or anyone who has ever imagined living on an island. Bass Harbor. My sister and I, cousins and aunt. 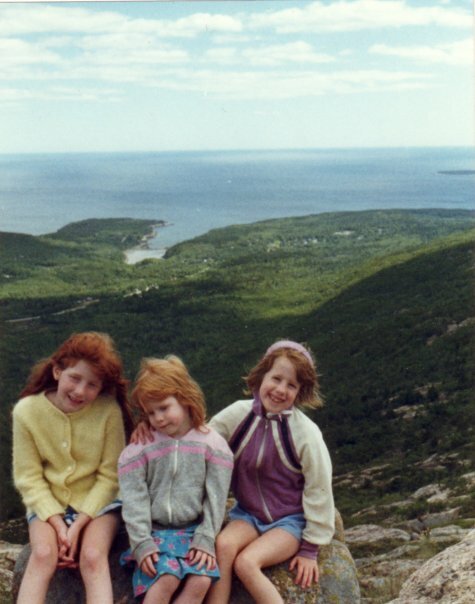 My sisters and I on Cadillac Mountain, with Sand Beach in the background. Mount Desert Island. I’m the one on far right.